This past week was a week when I had to purchase a car. According to my trusty mechanic, my old 2005 Honda Civic was begging for a retirement and I have to find a replacement soon. I initially had my eye on a Mazda 3 hatchback but after two bewildering dealearships later, I was perplexed why I was trying to fit my comforts in a Civic in a Mazda3. It finally dawned on me, stay within my comfort zone and get a Honda. Through all that stressful time of talking to an auto salesman, my friend Jojo was the comedic relief. When I was too tight, unbending and swift, Jojo was cracking up jokes that had an underlying intent of getting me the best deal I can walk away with. It was like double-time the haggling as I stood my ground on what I wanted and Jojo was getting me better value for my money. So after I signed the papers to a new Honda Civic, I just had to treat him to dinner. It was a good day to spend with a very good friend. Since we were in the Thornhill area, we went to a Korean restaurant that I had my eye for quite a while. It’s Piggy’s Restaurant at northeast of Yonge and Steeles. It always comes up when I do a search of highly rated Korean places but their best dishes I would say are meant to be shared. So I finally found my perfect moment and we came in happy and hungry. And of course I wanted the sharing plates and I knew Jojo would love the same thing. 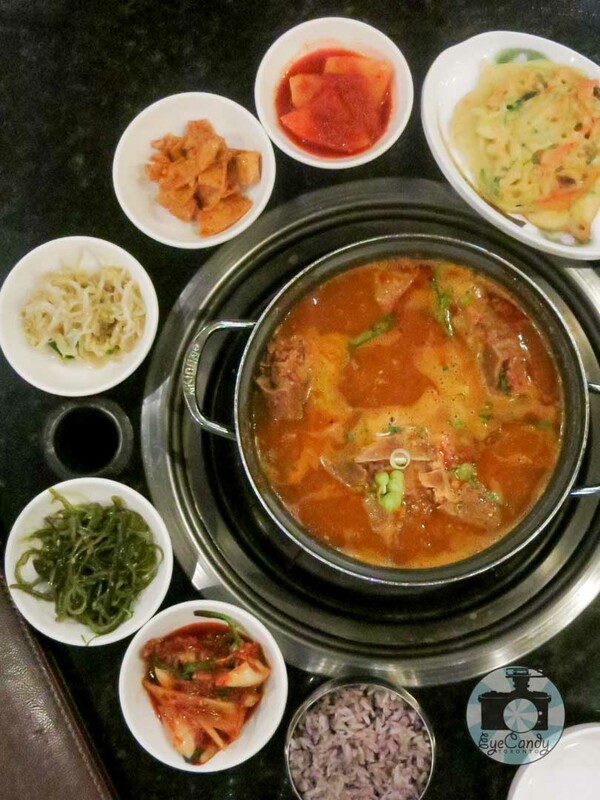 Korean and Filipino comfort food has a lot of things similar that I knew I would not go wrong with Mook Eun Gi Gam Ja Tang Jeongol – a pork back bone soup, made with potatoes, vegetables and Piggy’s House Special Kimchi for two. Back in Manila, we have the same base of soup, pork bones and potato they I grew up with. I was anticipating a perfect and comforting meal ending my day. Just because it was a Korean restaurants, we had a lot of small dishes to whet the appetite. Ban chan of fish cake, kimchi, seaweed, bean sprouts and onion pancake was placed on our table on top of the big soup boiling in the burner right in front of us. So with us rehashing the events of the day, it was such a satisfying dinner. Nothing beats the comfort of the taste of a really deep pork bone soup. There is no faking deep flavours and layered goodness. It was definitely what we got and enjoyed that night. I still drive a Honda Civic and I finally have my new baby to give me a lot more food trippins. Ah I guess it would also be the car to drive me back to Piggy’s restaurant. That soup is definitely a reason to come back once again.